Builder of Great Chalfield - Page 3. Tropenell owed his rise to prosperity not only to patronage but also to a good education and training in law. It has been noted that in those areas of the country such as East Anglia and the West Country, where the Lancastrians were strongest, local schools were more numerous. Eton and King’s College, Cambridge were founded by Henry V1 amongst other reasons to provide educated men to run the growing apparatus of the state but local grammar schools were also crucial for the proper functioning of life outside London. Tropenell must have had such a start. Further he was admitted to Lincoln’s Inn in the Michaelmas term of 1445 so he must have acquired some working knowledge of the law before then as an assistant to an experienced lawyer either in Lincoln’s Inn itself or more locally. He had conducted suits on his own account in the courts at Westminster since the early 1430’s and his employment as a trustee of the estates of Walter, first Lord Hungerford, in 1438 along with four other local ‘lawyers’ is an indication of his growing expertise. Lord Walter greatly extended his castle at Farley with the proceeds of ransoming French prisoners, the most distinguished being Charles, Duke of Orleans, after the battle of Agincourt in 1415.The story was later told that he put his foot on the neck of the Duke to secure his very valuable prize! This extension of the castle may well have led to Tropenell as his lawyer being involved for the first time in a major building project. If so he was to put this to good use later when he built Great Chalfield manor for himself. As a lawyer he was granted special admission to the society at Lincoln’s Inn in 1470 (receiving additional privileges), just as the great manor house was being built. This possibly indicates that he did not fulfil all the requirements for membership earlier. Life had perhaps been too short then to formally complete his studies but now he had arrived in the eyes of the profession. That he had a good grasp of the law was shown amply in the numerous documents copied into his cartulary. For example there are no less than 27 members of the de Percy family from which he was descended quoted in it. He was also well placed through his wives, patrons and local friends to acquire property. Inns are mentioned and a quarry at Hazelbury near Box that he bought in 1465, presumably to provide the stone for his manor which he built soon after. It was manors that produced the greatest income and prestige, for office and responsibility often went with them. We know of eight that he eventually owned outright. Great Chalfield is the most well known, the other seven were Maiden Bradley, East and West Codford, Chicklade, Hindon, Little Durnford (where his daughter Mary eventually lived) and East Harnham. They were all within touch of Salisbury where he also had properties and legal responsibilities. The land of these manors could produce a good income, one, Hindon, had 8 oxen, 249 sheep and 41 lambs when he first acquired it. Wool of course was the basis of local wealth then and trade in it both nationally and internationally was booming. The civil war though fierce did not interrupt this rising tide of prosperity because after the battles the troops went home without doing great harm to those who were not directly involved. This prosperity led nationally to a number of building projects, such as Tropenell’s at Great Chalfield, as those who were newly rich celebrated their wealth. Tropenell needed all of his grasp of legal procedures to secure the ownership of the manor of Great Chalfield, for which he had to fight long and hard in the courts. The de Percy family had owned it for at least 200 years. According to a pedigree Thomas constructed Katharine de Percy had married Walter Tropenell in 1260, and from them he was descended directly. His problem was that at least two others could also claim to be descended from the de Percy family. The main seat of the De Percys, who became Earls of Northumberland, was by then Alnwick Castle in Northumberland. It was a junior branch of the family that had built a fortified house in Great Chalfield on the site of the present manor, making use of an earlier Saxon leat as a moat. By the mid 15 th century it had become dilapidated. It is reasonable to assume this because the man who had occupied it before Tropenell, William Rous, was said to have sold his woods, tile stones, timber and houses to finance his dissolute lifestyle (Cart i 295). 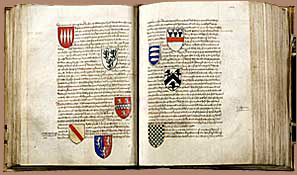 Tropenell took possession of it in 1443 after a legal dispute, the beginning of the saga that followed. The next problem was that Rous’s second wife was descended from Sir Harry de Percy who died in 1354. She encouraged him to try again. After he died she moved in before a decision had been made in the courts and had to be ejected. She settled for £53, a substantial sum for this manor. Sadly for Tropenell there was another claimant with a fair claim, also a descendent of Sir Harry de Percy, Thomas Beverley. He failed in his claim in 1444/5 but succeeded in 1467, 20 years later. By then Tropenell was thoroughly fired up and got it back in the same year. In all, with his frequent claims for the Constableship of Trowbridge which went with the manor, Tropenell had spent a very great deal of money and time on establishing what he saw as his rights to this manor.